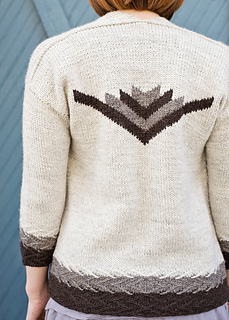 Midtown is a mid-weight, open front, cocoon sweater with fitted, three-quarter length sleeves. It features a chevron texture pattern set on end with ombré color transition at the hems and cuffs, and graphic intarsia motif at center-back. The sweater back and fronts are worked bottom-up and seamed. After seaming, sleeves are picked up and knit in the round leaving very little finishing work. I began designing this sweater with the concept of “hearts” in mind. I wanted to explore the idea of Kansas City as “The Heart of the Nation” as it is so often called, but actual heart shapes were far too cutesy for what I envisioned. I chose the jacquard stitch pattern for the front and hems of the sweater because it fits a Midwestern aesthetic, but also because when you look at it from the side it morphs into stacked hearts. 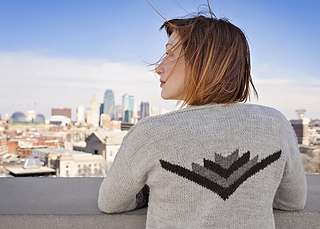 The tribal-inspired, striped motif on the back cradles another heart as its crown. 34 (39, 44, 49, 54, 58)“ chest circumference. 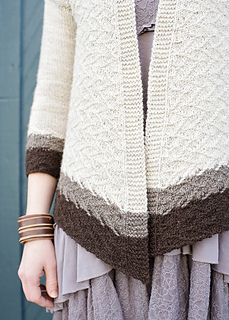 Cardigan shown in 34” on a model with a 32” bust. Fits best with 2–5” of positive ease. Yarn: Bare Naked Wools Kent DK, 60% merino/40% romney wools, 300 yds/4oz. : MC (White Sand) 900 (1020, 1150, 1250, 1380, 1470) yds, CC1 (Coconut Husk — darkest color) 190 (200, 225, 240, 260, 275) yds, CC2 (Driftwood – medium color) 135 (145, 160, 170, 185, 195) yds. for body pieces, and 16 & 12” cir OR double-pointed (dpns) for sleeves; Size 7 (4.5 mm): 30” cir. Adjust needle sizes if necessary to obtain the correct gauge.